The EcoHitch® hidden hitch for the 2010-2014 Subaru Legacy is designed to be completely concealed so you only see the receiver once it’s installed rather than having to see an unsightly crosstube underneath your vehicle. Rated for 525 pounds tongue weight and 3,500 pounds towing weight, the EcoHitch is full of personality that complements your Legacy. *If you’re going to be towing and need trailer wiring, click here! Ensure your wiring harness does not drag on the ground by visiting our Eclipse trailer wiring bracket page. This hitch for your 2010-2014 Subaru Legacy helps bring all the cargo you could need, your bikes and so much more. With enough cargo space to have all the creature comforts you love, your Subaru Legacy needs to have a trailer hitch that will match its classical design. 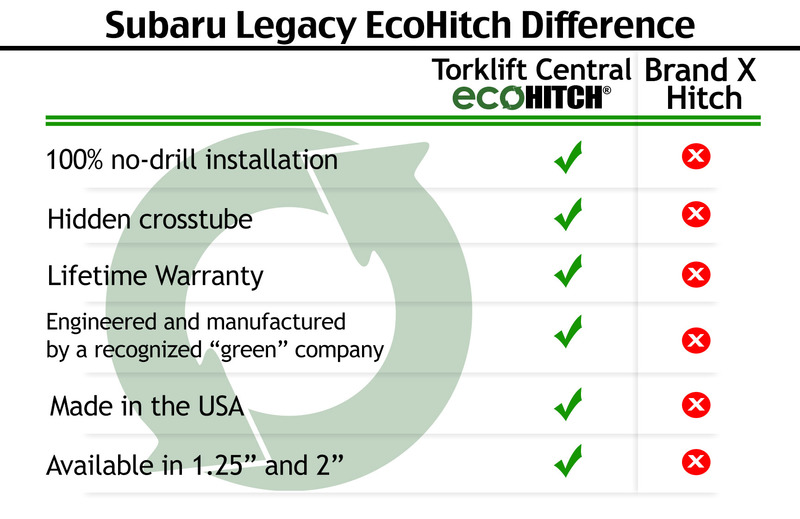 With the EcoHitch for Legacy, you are getting precisely that. Designed to fit the aerodynamic contours of your Subaru Legacy with only the receiver showing when it’s installed, this trailer hitch for Subaru Legacy is there to add even more options on what to bring for your next adventure. The EcoHitch® hidden hitch for the Subaru Legacy comes in both 1.25-inch and 2-inch receiver sizes so you get your choice of which bike racks and cargo trays will work best for the receiver you choose. With 525 pounds tongue weight and 3,500 pounds towing weight capacity you won’t have to leave anything behind with this hitch for Subaru Legacy. This Subaru Legacy trailer hitch will give you the ability to have a remarkable ride in your Subaru without changing its style or efficiency especially since the EcoHitch is designed to be lightweight and is made of recycled materials, making it eco-friendly.